Devotees and Deities at Sri Sri Radha Gopinatha temple in Sydney, Australia, joined an estimated 50 million people worldwide in making a statement on climate change and energy consumption. On Saturday, March 29th people across the world acted together to switch off their electric lights for an hour. The event is intended to be a symbolic gesture to empower political leaders to act against climate change and to encourage people to seek ways to use energy more appropriately. At the temple in Sydney, Australia a special kirtan was organized with acclaimed kirtan singer Carmella Baynie. 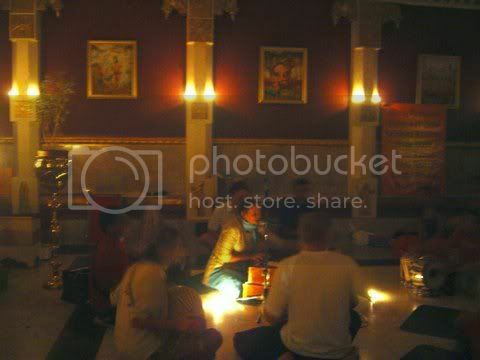 No electric power was used in the temple room, which was illuminated only by candles, as people from around Sydney met together to chant in glorification of the Supreme. The soft light given off by candles and lamps spread around the temple produced a very special atmosphere for the devotees and visitors. Outside in the temple forecourt a special vegetarian BBQ was served throughout the event, providing spiritual nutrition for those who came along throughout the night. The activities ended with the evening Arati ceremony in which lamps and other objects are offered to God and shared with those present. Vara Nyaka dasa, president of the Sydney temple, came up with the idea of blending the spiritual practice of kirtan with the idea of supporting Earth Hour. "Over one hundred people turned off their lights for an hour and came down to the temple to spend time with us, chanting, associating with devotees and sharing prasadam," Vara Nyaka said. "Only by proper choices and responsible living can we as individuals contribute to solving a global problem," Vara Nyaka said. "We can decide to give away a some of our private comfort in order to stop this endless machine. This is something we can do if we are spiritually strong." Earth Hour was started in Australia and is now celebrated by people from all over the world and the organizers are already preparing for the next one where they hope to involve many more people. "Make a plan to visit with us next year during Earth Hour," Vara Nyaka said.